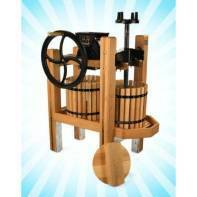 Top-of-the-line Cider Press & Grinder-- yet still affordable! The American Harvester Cider Mill and Wine Press is our top model and brings together the best features of mills and presses from the turn of the 20th century. Featuring the double-tub cider mill favorited in the early 1900s, this heavy-duty 4-leg unit is made of quality hard wood and cast iron for both the orchard farmer, homesteader family and individual enthusiast. This is not a unit designed for a short lifespan. This mill and press is a lifetime purchase that will become a treasured generational gift to pass down. Unlike other mills, the American Harvester has a design feature that both grinds and squeezes at the same time. The popular "Apple Eater" grinder reduces apples to "pulp like" texture for the most efficient press. This design features means the American Harvester can produce the most cider from apples-- and in the quickest way possible! By far, this press is the best hand-operated unit available! What other unit can boast 50 gallons of cider from one afternoon and two workers? Just the American Harvester! Grinds and Squeezes with the powerful Apple Eater! No slicing or pushing apples down with the Apple Eater! The polymer, bacteria-resistant drum assembly eats apples with ease and has an easy clean up. The frame is four-legged and is made of durable laminated hardwood. Joints are dadoed and cross-bolted. The press is unfinished for your staining preference. The press screw is a Acme-threaded 1 1/2", 22" long construction and passes through the cast iron cross-arm. Features a reinforced pressing disc and has a cast iron foot to distribute pressure evenly. The two hardwood tubs are beveled staves which aid in cleaning. They measure 12" high, 13 1/2" in diameter with banded heavy steel hops. Each tub has an approximate capacity of a box of pulped apples. Includes two juice rack for easy flower of juice. Features 5 1/2" polymer bacteria-resistant cylinder for easy clean up. The flywheel is 18lb cast iron construction and is attached to the grinding shaft for a smooth grinding speed. All the great features of the favorite presses in a modern design!